When OH and I first arrived in Melbourne we thought it would be a brilliant idea to have a no returns policy when dining out. That is, for a whole year we would not go back to the same restaurant twice – forcing us to continually be trying new places. There were a couple of major flaws to our brilliant plan; we are creatures of habit – we can’t help but go back to our favourites and quite simply, we fell in love with Richmond so we didn’t venture much past what was on offer on our doorstep. This year we have decided that once a month we will try a new restaurant. That’s where the system comes into play. It may surprise anyone who knows me reading this post that I am a bit of a control freak. I have a bit of a bad habit of vetoing OH’s choices where dining out is concerned. Some of this is valid as the choice may not be 12wbt friendly but mostly it’s because it’s not my choice. To stop me doing this we set some rules around The System; OH and I got to choose 12 restaurants each – including iconic, fine dining type of restaurants, we cross referenced these with The Age Good Food Guide, Urbanspoon and the Entertainment Book (yes I know – control freakish! But we are new to Melbourne so need to do research). We put these choices anonymously into a jar and each month one of us gets to pick a place from the jar. We use The System for major events – Wedding Anniversary, Valentines Day, Posh Spice visiting (my Sister in Law – more on that one in a later post), Birthdays etc. To celebrate Valentines Day I got to pick from the jar and I selected Il Bacaro, handily one of my choices that I’d been wanting to try for a while. OH made the booking and off we went – I was frocked up in my new size 14 dress (from the Flock of Kiwis visit) and OH in his best $10 shirt (nicer than it sounds – OH likes to buy stuff on sale and has a range of dress shirts that he picked up for $10). We had a lovely evening, the staff we very knowledgeable and very welcoming. We started with a glass of bubbles for me and a beer for OH and chose a lovely NZ merlot to go with our meal. Our waiter had picked up on our accents and gave us a bit of light hearted ribbing for choosing a NZ wine. Our entree was zucchini flowers stuffed with a ricotta and pea mixture. The were so delicious that we had eaten them before I thought about getting a photo for this post. 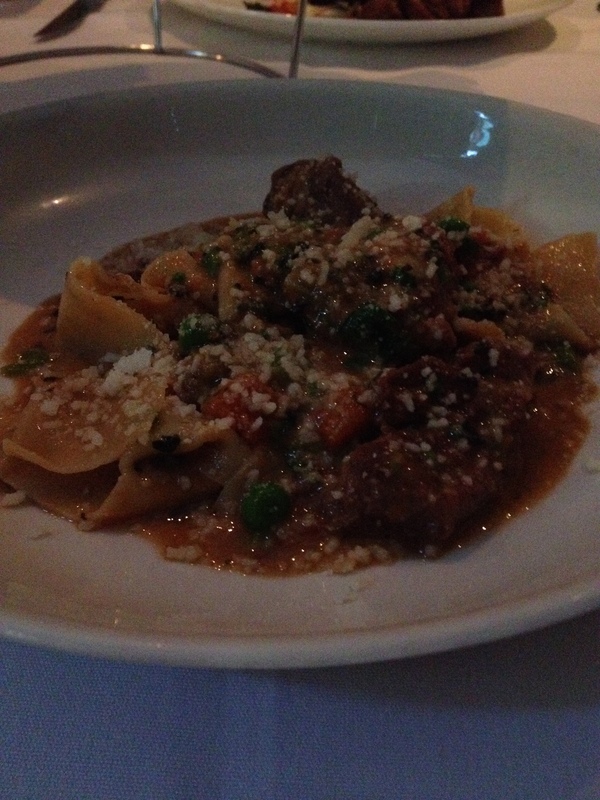 Main for me was an entree sized hand cut pappardelle with lamb ragu, truffle paste, peas and pecorino OH couldn’t resist the roasted duck breast, baked duck leg with celeriac, rainbow chard and mustard fruits. Both were delcious. I should explain my rating scale that I have borrowed from a Japanese student that we had living with us for a period of time. We could figure out how good a meal was through a rating scale of our cooking; from best to worse – yum, delicious and thank you (OH’s meals mostly got the thank you). So delicious is pretty up there. Desert was selected on the recommendation of one of the staff combined with us not so subtly spying on what our neighbours had and using that the rule out a couple of options we had been considering – I often suffer from severe food envy. The winning selection was baked apple with berry nut crumble and ricotta semifreddo which we shared accompanied by a couple of different desert wines (I should mention – one each) selected by our very helpful waiter. Desert was also pronounced as being delicious as well and was again devoured before I could consider photos. It was one of our more expensive nights out – around half the bill was alcohol (Craggy Range Merlot does not come cheap) but was definitely worth it. 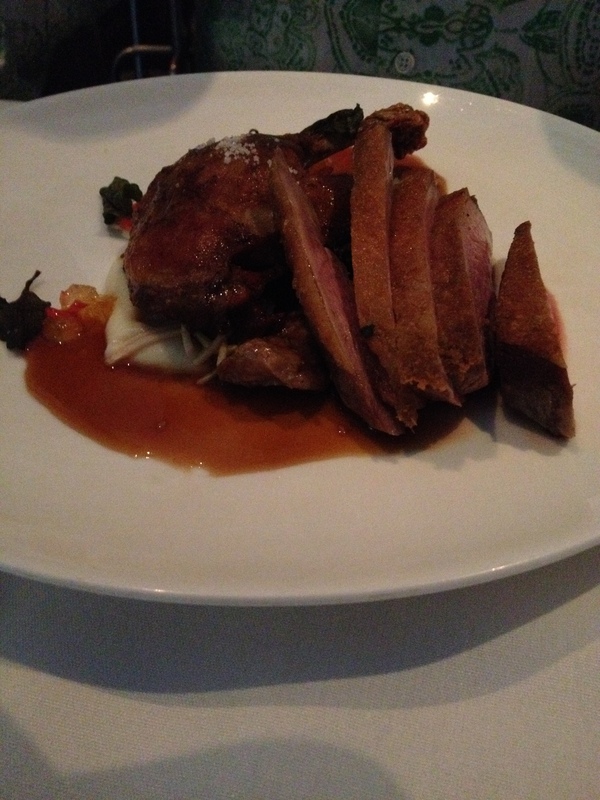 This entry was posted in Uncategorized and tagged 12wbt, Craggy Range, Il Bacaro, Italian, Melbourne, Richmond. Bookmark the permalink.